Entries are officially open ! 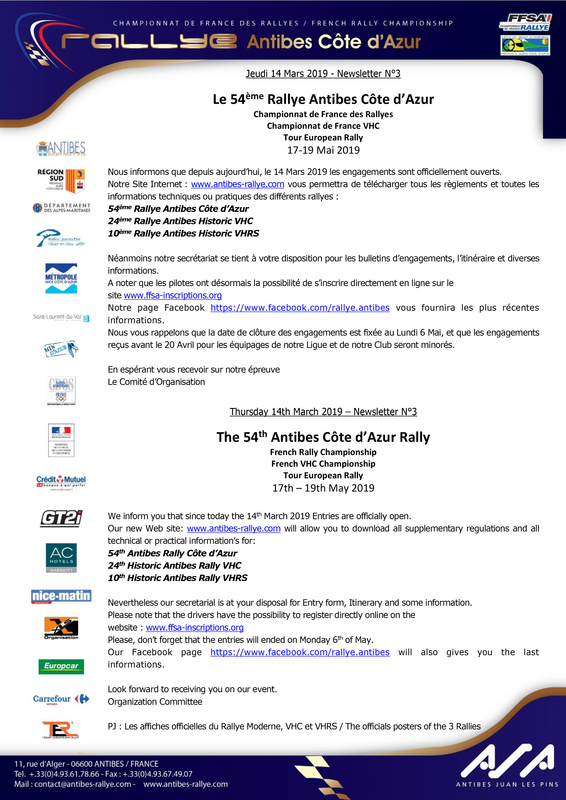 Newsletter 2 : Three Rallyes in one at the 54e Rallye Antibes Côte d’Azur ! SAVE THE DATE : 2019, 17th – 19th OF MAY ! The 2018 adventure ends… On the way for 2019 ! 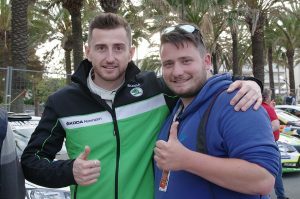 François Chatriot, the Guest of the 2018 Antibes Rallye Côte d’Azur ! 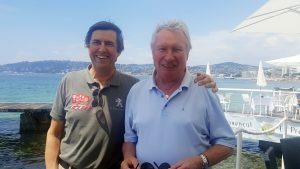 Our guest François Chatriot, Victorious Pilot of the 1989 Antibes Côte d’Azur Rally, with Didier Lefort come back to this 53rd edition : “it’s exceptional to see 170 competitors on the start line. This event always was famous ! Our Antibes Rally was long and very difficult with special stage during the night ! And today, this rally keep his pirit. For the service, it was a rally in the rally too. To drive during the night, it was magic! It has an extraordinary charm. And from the moment when we are good, we go so fast of day as of night! I would like to see again this configuration but for safety reasons, it’s impossible now and I can understand. Personally, in Antibes I always played to win ! The rally can start! 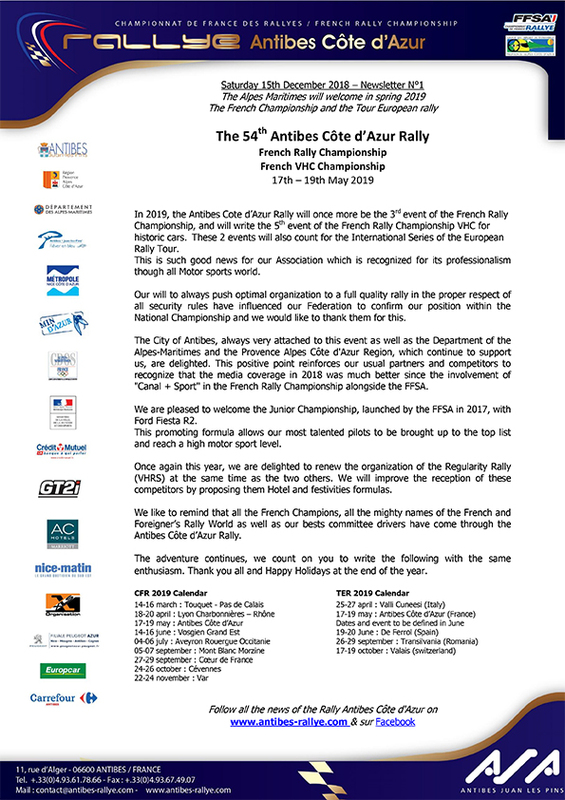 Everything has been made up in order to make of the 53rd Antibes Côte d’Azur Rally a Racing Event. 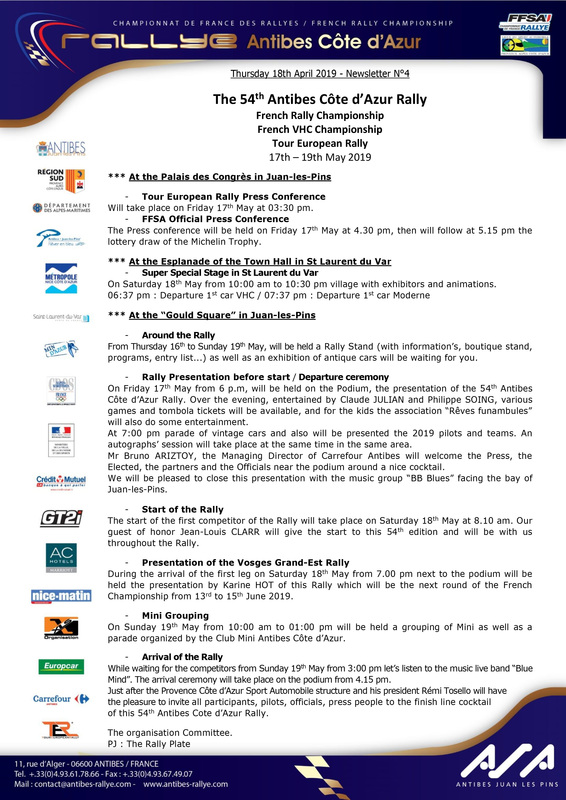 The entry lists of the French Championship and the Historic VHC and VHRS Rallies are a victory in themselves as over 170 teams are participating. We shall welcome warmly the return of Giandomenico BASSO on the Antibes Côte d’Azur Rally, leader of the Tour European Rally, winner on our event in 2009, who for our most great pleasure will quarrel with numerous other pretenders at the victory. Concerning the Rally VHC, the fight will be nonetheless very interesting as numerous specialists of the Region will be present and will try to steal the victory to French Championship leaders. The organisation committee has built around the event numerous new actions that certainly will hold exciting moments. This great sporting week will start on Friday 18th May from 5.30 pm on the podium at Gould Square in Juan-les-Pins will take place the presentation of the French Championship teams. All structures will start being set up from the beginning of the week in order to give the best start possible to this 2018’s edition. 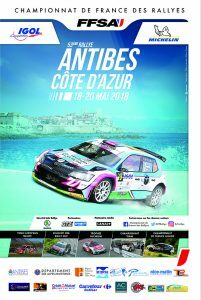 Our website: www.antibes-rallye.com will enable you to find any practical or technical information (Entry list, convocation, and program) and to follow the Rally in live. An Informations and « souvenirs »’s stand will be held next to the podium at the Gould Square in Juan-les-Pins from Thursday 17th to Sunday 20th May. 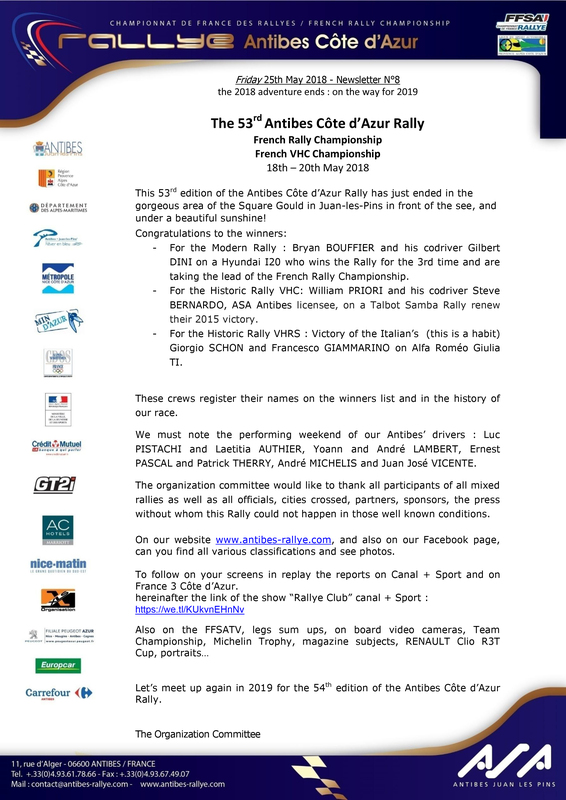 The PODIUM of departure and arrival as well as the CLOSED PARK will be based in the SQUARE GOULD, Boulevard Baudoin, in Antibes for this 53rd edition of the Rally Antibes Côte d’Azur from 18th until 20th of May ! The best European drivers will participate in one of the most mythical French rallies that it is to score points in the French championship of the Rallies (modern) or in the French VHC championship, intended for the historic vehicles. This rally will also count for the European Tour Rally. Without forget the VHRS championship in the category of “regularity”. 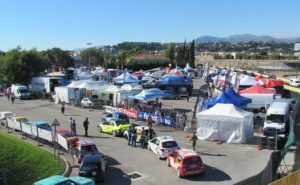 Crews and public will find the Service Park of the 53rd Rally Antibes Côte d’Azur by the DOOR B near the “Flower market” by the boulevard of Mercantour. The Northeast Parking will receive all the Teams, the Refueling Zone, the Manufacturers, a FFSA hospitality “information/press” and the official shop of our GT2i Partner. Be aware and drive slowly ! 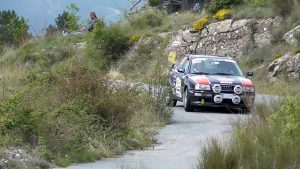 For this edition, three races will take the start of the Antibes Côte d’Azur Rally from 18th to 20th May in the Alpes Maritimes. Supported by the city of Antibes, the Departmental council of the Alpes Maritimes and the Region Provence Alpes Côte d’Azur, the 3rd step of the France Championship, the Antibes VHC Rally registered at the VHC French Championship as well as the Antibes VHRS Rally will stide along the 2018 itinerary. 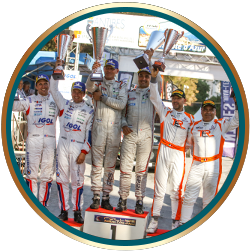 Please note the return of the Rally at an international level with the participation to the Tour European Rally. The organization committee will propose a very interesting and selective edition in accordance with the economical situation in order to allow as much participants as possible. 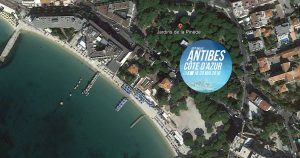 Juan-les-Pins will be in the heart of the competition, with the starts and finish podium from the “Pinède Gould” famous place of the Juan Jazz festival. The official presentation of the teams as well as the autograph’s session will take place there on Friday 18th May as well as various animations during the whole week. 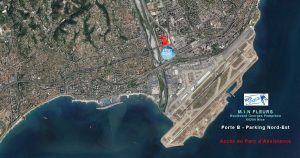 The assistance park will find the enclosure of the MIN of Nice. 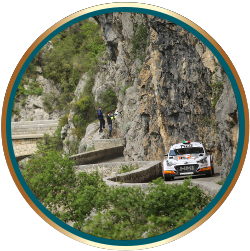 The Rally headquarters will be held this year at the Palais des Congrès in Juan Les Pins will gather all the information related to the safety of the event as well as the press room. Azur Arena will welcome the technical and administrative checking before race. CFR : This Rally will start at 08:15 Saturday morning and will finish on Sunday around 05:00 pm. 12 stages are to be run with 6 different ones with 204 kms qualifying distances. The Saturday legs take on 6 ES including the selective SS « Col de Bleine – le Mas – Aiglun » which will allow a first ranking before the Sunday and the famous « Col du Turini » whose itinerary has been completely renewed. Please note de participation of the competitors of the «Peugeot 208 Rally Cup» as well as the Junior French Championship. These promotion devices allow our best young pilots to pretend reaching a professional level. for 150 kms qualifying distances. This Rally will join the CFR at the assistance park, and will take departure before it. Historic (VHRS): This Rally will take place only on Sunday. 98 Kms of regularity zones. The Saturday afternoon will be reserved to verifications, followed by a welcome cocktail. The price giving will take place during the Cocktail organized by the city of Antibes at the Azur Arena on Sunday evening. A very short timing for a very economic event. Engagements: The rules books will be published from 15th March. 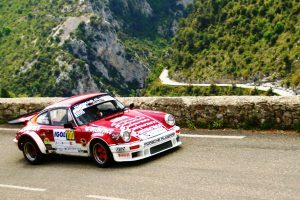 Or on our Facebook page: https://www.facebook.com/rallye.antibes come and join us. We rely on you to write the following with us with the same excitement and thank you in advance.